Floyd Mayweather Jr. has never lost a professional fight. (Getty Images). 'Tough times don’t last, tough people do' - Floyd Mayweather Jr. 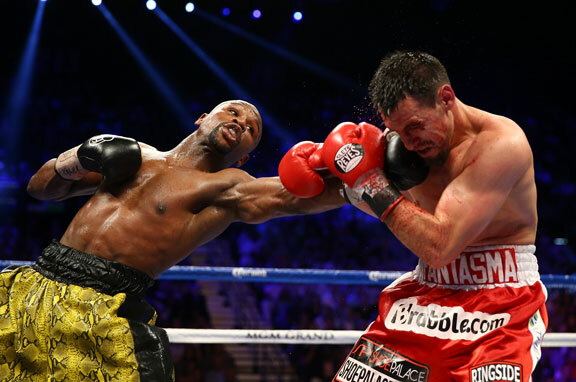 When Floyd Mayweather Jr. stepped into the ring against Robert Guerrero this year, he didn’t just win his 44th professional fight, he added another $34 million to his personal fortune. Forbes.com calculated that he earned almost $175,000s per punch or - the way I saw it - he could have paid off my 30-year mortgage in the time it took to scratch his nose. Never has a nickname been more appropriate. They call him “Money”. Later this year, Mayweather will become even richer when he takes on Mexico’s unbeaten light middleweight champion Saul “Canelo” Alvarez in Las Vegas. It is hard to avoid the topic of money when interviewing Mayweather. The words “Money, Power, Respect” were plastered across both his cap and his t-shirt and it didn’t take long for the subject to crop up, though he brought it up first. The interview was underway when a communication mix-up led my producer Sam Krumov to open the door for one of Mayweather’s many bodyguards. Mayweather turned around - shot Sam an icy glare that lasted a good five seconds - and in no uncertain terms instructed him to never, ever do that again. He could have said: “You’re cutting into my time”, but they also say that “Time is money” and so perhaps in Mayweather’s world, the two words are interchangeable. Fortunately the door was closed without further incident. Mayweather returned his attention to the interview and our producer breathed an almighty sigh of relief. Prior to our meeting, Mayweather and Canelo had been squaring off in Atlanta’s Centennial Olympic Park, part of a nationwide tour through 11 cities to promote their fight. It is all part of the game now that Mayweather is his own promoter. Mayweather’s wealth is such that he could only have imagined once upon a time given his well documented deprived and troubled childhood. He grew up in Michigan, pretty much raising himself. His Mum was a drug addict and his Dad was in jail during key stages of his development. Mayweather told me that he thinks of these times whenever he’s lacking motivation. "When I'm in the gym I think back. I said to myself, 'I want a certain lifestyle, I want to be wealthy one day, I want to be the best.’ Tough times don’t last, tough people do." Mayweather was in a reflective mood and our conversation took some unexpected turns. Since he’s never lost a professional fight, I asked him about the last time he’d lost at something else. My next question, a playful but provocative - “When was the last time you cried” - suddenly seemed redundant. He may only be five foot eight inches in height, but Mayweather is undoubtedly one of the biggest personalities in world sport - his personal entourage of at least 20 people helped to confirm that. We spent 15 minutes together, which - by my reckoning - means he could have earned around $14 million if he’d spent that time punching someone in the ring. Fortunately we were just talking, but hopefully he won’t send us the bill! superb athlete with interesting persona.